Fine Art Shippers is a full-service art and antique transport company serving art business professionals and private clients all over the United States and abroad. For today, we offer national and international fine art and antique moving services, packing and crating services, art installation, art storage, and a whole range of other services related to the art and antique transport industry. Moreover, in addition to all these art logistics services, we also love to help emerging artists promote their art and organize different exhibitions and shows. How about promoting our own company? Well, not so long ago, we were lucky to get acquainted with the work of QueenMats, and this company makes truly amazing custom logo mats for any taste and budget! QueenMats is a reputable international design company with branches in the United States, the United Kingdom, Canada, Australia, and New Zealand. 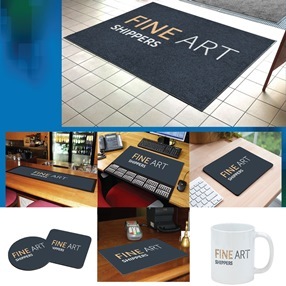 Its specialization is high-quality custom logo mats ranging from classic entrance mats of any type and material to felt coasters, mousepads, barmats, and mugs, each with the easily recognizable corporate design of their clients. These guys can make even heavy duty logo mats that are just perfect for heavy traffic areas and entrance locations to stop unwanted dirt. As one of the best art and antique transport companies operating worldwide, we appreciate a high-quality service, and we definitely enjoy working with true specialists who love what they do. QueenMats is indeed a great place to come for custom logo mats, and we highly recommend this company to everyone!